[S9] Births, Church Record, June 1977 to September 1944 St. Joseph's Church, Margaree, Records, page 12, line 13. Language*: John Archibald Collins spoke English. [S9] Births, Church Record, June 1977 to September 1944 St. Joseph's Church, Margaree, Records, page 14, line 13. Ancestry.com. British Columbia, Canada, Death Index, 1872-1990 [database on-line]. Provo, UT, USA: Ancestry.com Operations Inc, 2001. Original data: British Columbia Vital Statistics Agency. British Columbia, Canada. British Columbia Vital Statistics Agency: P.O. Box 9657, Stn Prov Govt, Victoria, BC V8W 9P3. [S314] 1891 Canada Federal Census, 101 Newbury Street, Boston, Suffolk, Massachusetts, USA. Language*: Mary Isabella Collins spoke English. [S9] Births, Church Record, June 1977 to September 1944 St. Joseph's Church, Margaree, Records, page 16, line 13. [S1067] 1921 Canada Census, MacLeod #2436. [S1068] 1911 Canada Census, MacLeod #2436. [S427] CBGHA, online www.cbgha.org, January 2014 edition. Nova Scotia Archives; Halifax, Nova Scotia, Canada; Death Registrations: 1864-1877; 1908-1966; Volume Number: 1959; Page Number: 3065. Language*: Alexander Dougald Collins spoke English. [S9] Births, Church Record, June 1977 to September 1944 St. Joseph's Church, Margaree, Records, page 24, line 28. Ancestry.com.Web: Canada, Virtual War Memorial Index, 1900-2014[database on-line]. Lehi, UT, USA: Ancestry.com Operations, Inc., 2016. Library and Archives Canada; War Graves Registers: Circumstances of Death; Box: 1650861 - 2437b - Alexander Dougald Collins.docx. Language*: Alan Hugh Collins spoke English. [S9] Births, Church Record, June 1977 to September 1944 St. Joseph's Church, Margaree, Records, page 28, line 8. Ancestry.com.Canada, WWI CEF Attestation Papers, 1914-1918[database on-line]. Provo, UT, USA: Ancestry.com Operations, Inc., 2006. Images are used with the permission of Library and Archives Canada. [S9] Births, Church Record, June 1977 to September 1944 St. Joseph's Church, Margaree, Records, page 32, line 29. Language*: Catherine Isabella Collins spoke English. Married Name: As of 10 August 1920,her married name was Gaudet. [S9] Births, Church Record, June 1977 to September 1944 St. Joseph's Church, Margaree, Records, page 38, line 2. Religion*: Daniel Angus Collins was Roman Catholic. [S9] Births, Church Record, June 1977 to September 1944 St. Joseph's Church, Margaree, Records, page 40, line 3. [S489] Donald James MacFarlane, St. Joseph's Church Cemetery, S. W. Margaree, Row 3rd last, plot 2. Religion*: Mary Ann Collins was Roman Catholic. [S9] Births, Church Record, June 1977 to September 1944 St. Joseph's Church, Margaree, Records, page 40, line 22. [S9] Births, Church Record, June 1977 to September 1944 St. Joseph's Church, Margaree, Records, page 42, line 13. [S9] Births, Church Record, June 1977 to September 1944 St. Joseph's Church, Margaree, Records, page 42, line 26. [S5] Marriage, Church Record, November 1884 to September 1935 St. Joseph's Church, Margaree, Records, page 42, line 26. [S9] Births, Church Record, June 1977 to September 1944 St. Joseph's Church, Margaree, Records, page 44, line 24. Birth*: Aubin was born circa 1900. Birth*: Maria was born circa 1900. 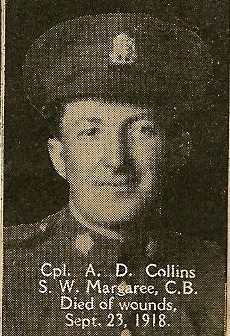 Married Name: As of 10 October 1953,her married name was Collins. Married Name: As of 17 November 1892,her married name was Collins. Birth*: Dennis was born circa 1865. Death*: Dennis died circa 1925. [S9] Births, Church Record, June 1977 to September 1944 St. Joseph's Church, Margaree, Records, page 20, line 9. [S341] Registration form to Gathering 2001 Committee, August 3, 2001, Sheets 4,57. The National Archives at Washington, D.C.; Washington, D.C.;Manifests of Alien Arrivals at Eastport, Idaho, 1924-1956; Record Group Title:Records of the Immigration and Naturalization Service, 1787 - 2004; Record Group Number:85; Series Number:A3460; Roll Number:021. [S9] Births, Church Record, June 1977 to September 1944 St. Joseph's Church, Margaree, Records, page 24, line 25. Religion*: Alexander MacFarlane was Roman Catholic. [S326] 1881 Canada Federal Census, 101 Newbury Street, Boston, Suffolk, Massachusetts, USA. [S100] Obituaries from The Casket Newspaper, 1852 - present, Obituary of Alexander MacFarlane, 43-1894-28-5. Language*: Ann Kennedy spoke Scotch Gaelic. 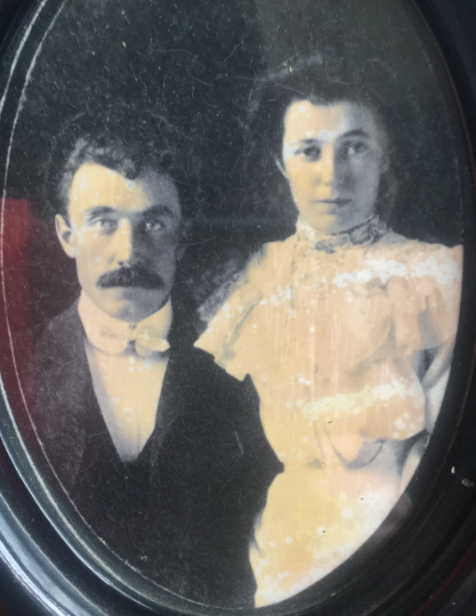 Married Name: As of 24 July 1888,her married name was MacFarlane. MacFarlane, Mrs. John D. 1945-42-8-? [S601] Weddings from The Casket Newspaper, 1852 forward, Mr. & Mrs. John MacFarlane 50th Wedding Anniversary. [S709] Diocese of Antigonish, Nova Scotia, Canada , Marriage record of John D. McFarlane and Annie Kennedy, page 140. [S871] 1921 Canada Census, McFarlane # 0348.